“This is what I love,” said Gamana Yarow, a 27-year-old mother of four, of working on Intervale Farm in Maine. 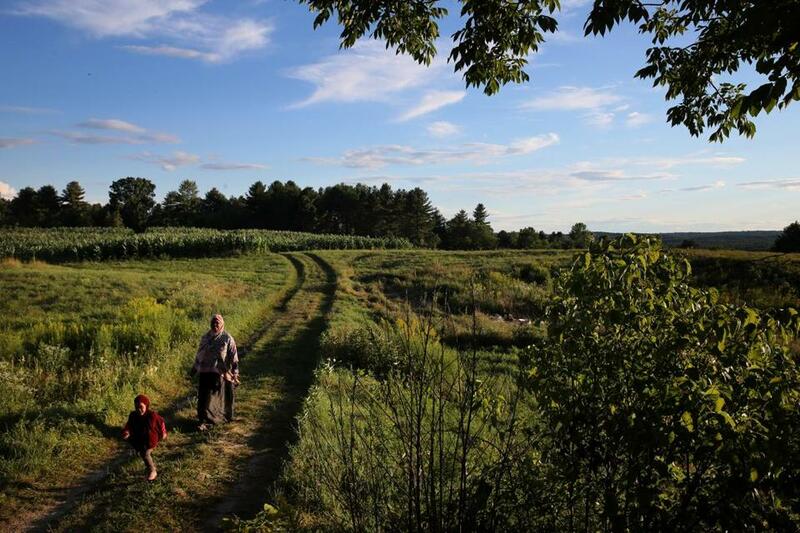 NEW GLOUCESTER, Maine — Six-foot stalks of corn crowd a small rise at Intervale Farm, a 19th-century spread of rolling fields that lead to the Royal River. It’s a picture of vintage Maine, but there’s something new: farmers clad in swirling, vibrant, dazzling colors rather than grass-stained denim and John Deere caps. The men and women working the soil are refugees from Somalia, ethnic Bantus who fled a brutal civil war more than a decade ago and found their way to an unlikely home in Lewiston, a former mill city 35 miles north of Portland. They clung together in tenements, strangers in a wary city where their reception ranged between chilly and hostile. But now, after years of gradual acceptance, they are emerging to rediscover the joys of an agrarian past. Yarow works one of 33 plots the Somalis are renting at Intervale Farm, 118 rolling acres where pumpkins and squash were king until owners Jan and Carl Wilcox decided to leave the fields and rejoin the business world. Ethnic Bantus who fled a brutal civil war more than a decade ago have found their way to an unlikely home in Maine. The Somalis were looking for land to grow vegetables, the Wilcoxes were looking for help with their property taxes, and a lease was signed this spring for about three acres, which have been divided into plots of one-tenth of an acre each. Thirty-six families work the plots, and 20 more are on the waiting list for Intervale Farm, about 12 miles south of Lewiston. “We thought it would be a win-win for everybody,” said Jan Wilcox, a technical writer for an engineering firm, who said pumpkin farming had become too time-consuming and arduous. Wilcox doesn’t miss the back-straining work, but she admires the way the Somalis are doing it. “They have the best gardens out there,” Wilcox said. 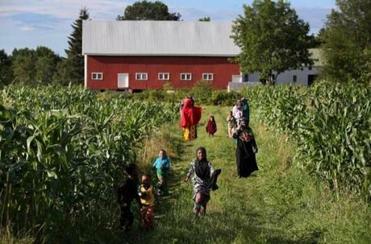 Gamana Yarow works one of 33 plots the Somalis are renting at the 118-acre Intervale Farm. They are fertilizer-free gardens brimming with corn grown with African seeds. There are beans, kale, and cilantro, too — all of which makes it back to kitchens in Lewiston, where exotic garb and aromas from the Horn of Africa are staking a claim in a city long accustomed to French-Canadian customs and cooking. The farmers do not work in the fields all day but rather travel to Intervale for a few hours near dusk. The work has become more of a therapeutic hobby. It’s a life that continues to expand from the crowded Lewiston apartments where many Somali refugees, drawn by word of mouth and low-cost housing, arrived from 100 American cities in 35 states. Lewiston officials estimate that between 4,000 to 5,000 Somalis live in the city, which has an official population of 36,000. At first, Lewiston residents worried that they could not afford a large influx of impoverished African immigrants. The city’s mayor wrote an open letter in 2002 urging Somalis, nearly all of whom are Muslim, to slow down their migration. And in 2003, a white supremacist group based in Wyoming traveled across the country to stage an anti-Somali rally in Lewiston. Macdonald has since changed his perspective. 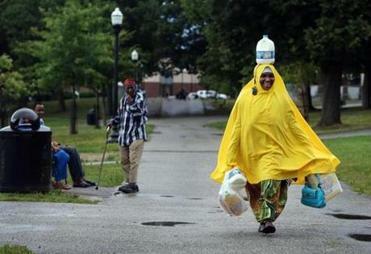 A Somali woman passed through Kennedy Park in Lewiston, Maine earlier this month. Other signs of acceptance abound. A Somali man sits on the School Committee, the police are looking to recruit Somali officers, and the children of refugees are beginning to graduate from college. Somalis have found jobs with the city, at L.L. Bean and Walmart, and in the many Somali stores that have emerged along downtown Lisbon Street. Lincoln Jeffers, the city’s director of economic and community development, estimated that the unemployment rate among Somalis in Lewiston is only slightly higher than the state rate of 4.7 percent. 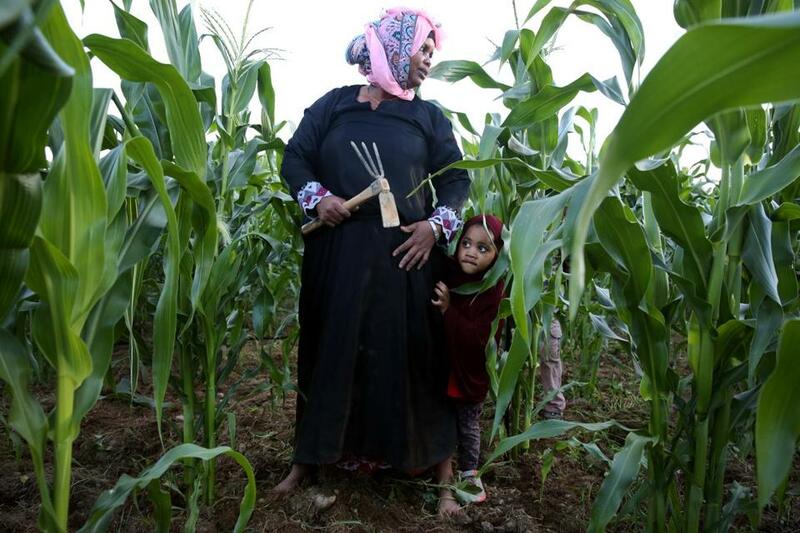 Deeper roots have brought greater acceptance and an improved quality of life, said the Somali farmers, nearly all of whom are now US citizens. Maryan Osman carried her groceries home. Libah and other Somalis said they have good relations with their white neighbors — much better than they had with other ethnic groups in Somalia, where the Bantu have been marginalized since being brought as slaves to the Horn of Africa centuries ago. 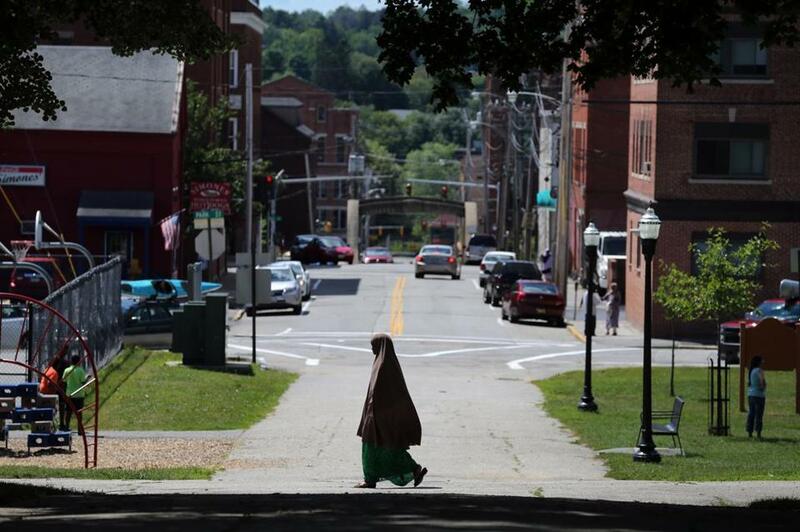 Just less than half of Lewiston’s Somalis are Bantus, Libah said. For Yarow, the peace of mind she feels in Lewiston is far from the anxiety of inner-city living in Dallas and St. Louis. The farm is another building block in the foundation of this newfound freedom. From these modest agricultural roots, Libah envisions a future in which Somalis own farmland, grow crops for traditional medicine, and serve African cuisine in thriving restaurants. Their piece of Intervale Farm is a start. Hands on hips, Adow stood in the waning light of a soft summer evening and compared her corn with Yarow’s in the neighboring plot. Adow’s corn was shorter and skinnier, and the older woman was at a loss for answers. “What’s going on here?” Adow asked with a laugh. Yarow offered some quick advice, and the pair bent again to their work — sweating but content, far from Somalia but never far from its horrific memories.